The Higher Education User Group's Alliance 15 software conference kicks off this Sunday, March 15, in Nashville, Tennessee. You're going, right? I'm flying early this weekend myself. Just have a few conference things to do to get ready for my little role in this big Oracle user group conference. 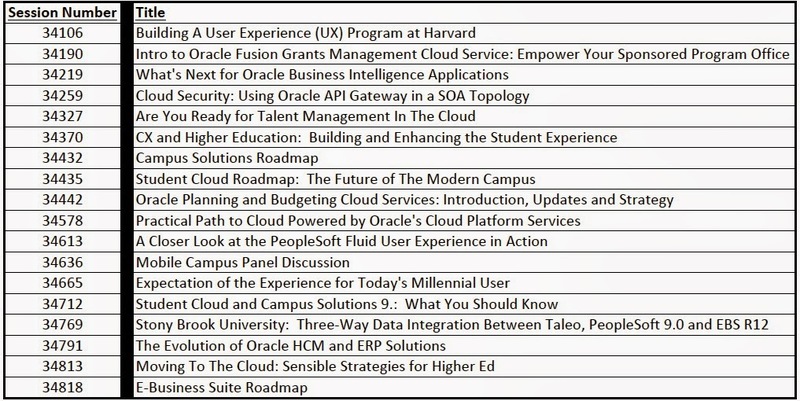 getting updated with the latest news on Oracle's roadmaps for their various Higher Education products. I suspect that an underlying theme about the need for higher levels of successful student engagement will encompass all five of these focus areas in one way or another. Taleo Cloud Demo: Tuesday, March 17 12 noon-1 p.m.
Financials Cloud Demo: Tuesday March 17, 2:00-3:00 p.m.
HCM Cloud Demo: Wednesday, March 18, 7:45-8:45 a.m. So, other than those sessions where I'm presenting, I looked over the catalog of sessions with my three areas of focus in mind. What follows is a list of the sessions that look good to me. I didn't include session times or locations, as you can get to those details via the Agenda Builder. If you do look up my list, you'll see there are time conflicts involved - a sign of a good conference is that you have to make difficult choices about how to spend your time - so you won't be able to catch all of these sessions...these are just the sessions that piqued my interest. Maybe you'll be interested too? So that's what looks good to me at Alliance 15. Let me know what looks good to you if you're going, and let me know how it really turned out for you after the conference...love those comments!